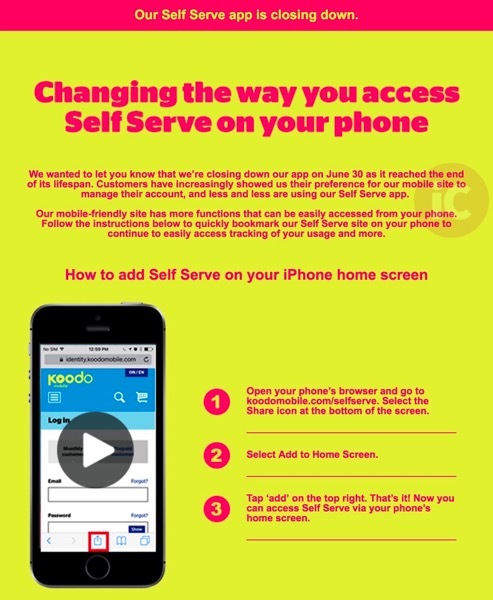 Telus-owned Koodo Mobile has announced their Self Serve iPhone app is shutting down. Instead, customers are being directed to use their mobile-friendly site to manage their account. We wanted to let you know that we’re closing down our app on June 30 as it reached the end of its lifespan. Customers have increasingly showed us their preference for our mobile site to manage their account, and less and less are using our Self Serve app. Koodo explains in three steps how customers can add a shortcut to the mobile-friendly self serve site to their home screen. Just visit koodomobile.com/selfserve, go to the Share icon in Safari at the bottom of your screen, then select ‘Add to Home Screen’, then ‘add’. The Koodo Self Serve iPhone app first launched back in January of 2013. Its most recent update was January of this year, which added bug fixes and performance enhancements. 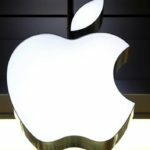 The app will shut down on June 30, 2017. There was no stated reason as to why the app was shutting down. Maybe Telus and Koodo have decided developer resources could be used elsewhere instead, cutting costs. Koodo Mobile customers—what’s your preference? A dedicated Self Serve app or their mobile-friendly site?